Noida: If you are looking forward to parking your car at stations along the 29.7 km Noida-Greater Noida Metro route and hopping on to a train to work or destination, this is news you could use. 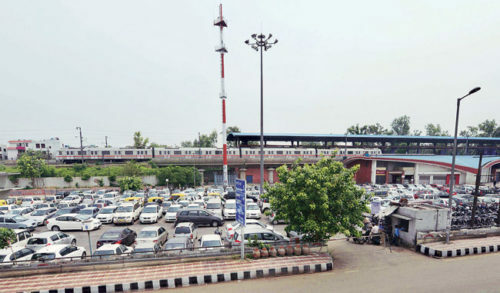 Having decided to have parking facilities at each of the 21 Metro stations along the Metro corridor, Noida Authority on Wednesday said that land has been earmarked for the same. While nearly 4,000 square meters of area to house a minimum of 100 vehicles has been identified at nearly all the stations, for some stations 10,000 to 12,000 square meters of land has been reserved. Officials of Noida Metro Rail Corporation (NMRC), Noida Traffic Cell and Noida Authority conducted a survey of the parking space at stations on Wednesday. As per officials, land has already been identified at all the sanctioned Metro stations along the Noida-Greater Noida track. The parking area at each station will be demarcated within the next 15-20 days. The actual transfer and handing over the land to NMRC will take place after that. The total parking area around Metro stations is different at each station depending on available land. The parking facilities are envisaged to generate up-front as well as recurring revenue for NMRC to supplement its fare-box collections in the operations phase, officials said. Officials further said that at least two Metro stations on the route will also have retail outlets, eateries and coffee shops as NMRC has decided to lease out space for business development. The move will give commuters more options to shop and grab a bite while generating additional revenue for the Noida Metro. “We have worked out the feasibility and the number of parking spaces to be developed for four as well as two wheelers,” said Shailendra Bhatia, Officer on Special Duty, NMRC. “We also plan to develop some stations into business hubs. These will be holistic in nature and come complete with malls, retail shops, offices, parking area, police post and restaurants,” he explained. “The aim is to make the Metro stations user-friendly,” Bhatia said. Meanwhile, pre-engineered building (PEB) work was started on Wednesday at the sector 71 Metro station by Santosh Kumar, Managing Director, NMRC. “A steel roof will be put into place at platform level. The roof will also have solar panels on top. The concept of PEB is one where the fabrication is completed in a controlled environment with the latest technology, and then subsequent erection is carried out,” he explained. “Work on all 21 stations will be completed next year by August 2017,” Yadav added.